One of the comedians hitting Melbourne this year as part of the Melbourne International Comedy Festival is Tanyalee Davis and Subculture’s Dave Griffiths sat down with her to have a chat about what audiences can expect from her brand new show. You can listen to or download our Tanyalee Davis interview right here. With the 2016 Melbourne International Comedy Festival coming to town Subculture Entertainment’s Dave Griffiths caught up with comedian Michael Shafar who is part of the 3 Course Comedy show. You can listen to or download our Michael Shafar interview right here. With the 2016 Melbourne International Comedy Festival coming to Melbourne Subculture Entertainment’s Dave Griffiths chatted to Ben & James Stevenson, the talented comedic twins that make up The Stevenson Experience. Dave speaks to the pair about what audiences can expect from their brand new show Twinfinity at this year’s comedy festival. The show runs from the 24th March to the 17th April at Roxanne. You can listen to or download our The Stevenson Experience interview right here. With Comedy 4 Karma just around the corner Subculture Entertainment’s Dave Griffiths caught up with the MC of the night Wes Snelling. 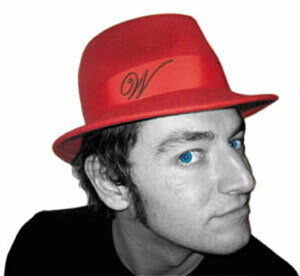 You can listen to or download our Wes Snelling interview right here. 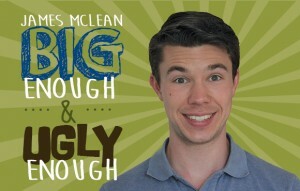 With James McLean’s new show Big Enough And Ugly Enough about to land at The Butterfly Club in Melbourne Subculture Entertainment’s Dave Griffiths decided to sit down with James and talk to him about the show and the events in his life that have inspired it. 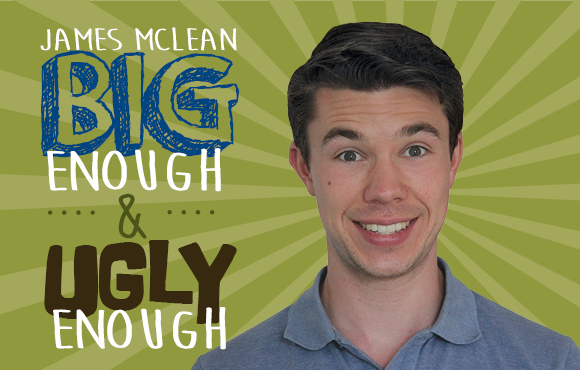 You can listen to or download our James McLean interview right here. Show details: Big Enough and Ugly Enough. Subculture Entertainment’s Dave Griffiths chats to comedian Joel Creasey about his new show The Hurricane which runs from 26th March – 19th April as part of the Melbourne International Comedy Festival. Aside from The Hurricane Joel also chats to Dave about his shows in the United States that caught the attention of Joan Rivers and his recent ‘stay’ on hit show I’m A Celebrity Get Me Out Of Here. You can listen to or download our Joel Creasey interview right here. You don’t get the nickname Amanda ‘F**king’ Palmer for no reason. It’s a name that Palmer has earned for her brash-in-the-face style of performance that she begun with The Dresden Dolls and has continued on into her solo career. Now, after an ugly spat with her record label Palmer has independently released her second full-length album titled Amanda Palmer Goes Down Under. As the album art suggests this isn’t music for little ears, but the more mature audience will love the fact that she has mixed comedy with her typical cabaret-punk style and ended up creating a very special album indeed. Palmer shows she is the ultimate performer by not just releasing a live album, instead she recorded live the songs that she wrote on her recent tours of Australia and New Zealand… meaning that for anyone not lucky enough to be at her live shows everything is completely new. Palmer lets her comedy do the talking from the start with her own warped version of the classic, “Makin’ Whoopee” and then thrilling her Aussie audience with her ode to ‘going to Australia’, the simply titled “Australia”. Palmer then takes a leaf out of Tim Minchin’s book with the over-the-top comedy track, “Vegemite (The Black Death)”. And it’s great to hear that while she lashed one of Australia’s icons the audience laughed instead of getting offended. It’s a pity that the comedy in her new single, “Map Of Tasmania” doesn’t match the rest of the album, because to be blunt it really is a let down and an embarrassment to Palmer’s normally great works of art. The bad taste that was “Map Of Tasmania” soon leaves though when you hear the sweet “In My Mind” and her brilliant duet with Tom Dickens, “Bad Wine And Lemon Cake”. The laughs keep coming with her crass tribute to New Zealand, titled “New Zealand” (what is it with Palmer and simple titles). The only thing is if you are easily offended than it is best to give “New Zealand” a wide berth. However, it seems that Palmer saves the best for last. The legendary, Mikelanglo joins Palmer on stage for the sexual innuendo-laced “A Formidable Marinade” but even that is outclassed by her closer, a cover of Nick Cave’s “The Ship Song”. This is an amazing cover that really showcases just how good Palmer really is. This really is the album that shows Amanda Palmer has a strong, unique solo career ahead of her. Amanda Palmer has had a rough past twelve months. Many have mused whether putting her popular duo, The Dresden Dolls, on hold was a wise move and she also had an ugly split with her record label. Now Palmer comes out swinging with her second solo album, an album consisting of songs she recorded live or wrote on her recent tour to Australia. As the title, Amanda Palmer Goes Down Under (and the cover art) suggests Palmer doesn’t exactly write music for children… but remember this is a woman whose nickname is Amanda ‘F**king’ Palmer, and hey who said it’s bad to be crude occasionally. In fact one of the best things about this album is the fact that Palmer can seamlessly switch between her regular cabaret-punk and full-on comedy (think Tim Minchin) in a heartbeat. Palmer opens with the comedy bone in full swing with her own take on the classic “Makin’ Whoopee” and then easily wins over her Australian fans with her original track about ‘going to Australia’… strangely-enough titled “Australia”. Her Tim Minchin-esque comedy comes in to play on “Vegemite (The Black Death)” where she savages one of Australia’s icons (much to the humour of the locals), however her new single “Map Of Tasmania” does let the album down. It’s supposed to be funny, but most listeners will barely raise a smile. Palmer lets that slip pass by with the sweet little folk song, “In My Mind” and then follows up with a great duet with Tom Dickens. Palmer then pays homage to Australia’s sister, New Zealand with the crass (but of so funny) “New Zealand” and then hits a new high with the moody and dark “On An Unknown Beach”, it sounds forlorn but is so attractive to listen to. Palmer continues to win over Aussie fans with a cover of Australia’s unofficial national anthem “We’re Happy Little Vegemites” and then returns to her classic Dresden Dolls style to pump out “Doctor Oz”. Another highlight on the album is the sexual innuendo-laced “A Formidable Marinade” but even that is overshadowed by a brilliant cover of one of Nick Cave’s best tracks “The Ship Song”. Palmer brings such emotion to this album, that she makes it a must listen. If you’re a fan of The Dresden Dolls chances are you’ll love this album, and if you saw Amanda Palmer when she was Australia then you’ve certainly got to add it to your collection… and you’re extremely lucky. A funny little album that shows that Palmer has more than one string in her bow.